For a simple geographical information system (GIS) not concerned with complex projections of the surface of a sphere onto a 2D surface, nor concerned with features of the landscape such as rivers, lakes, coast lines, mountains, nor with technological features of the built environment such as roads and bridges. 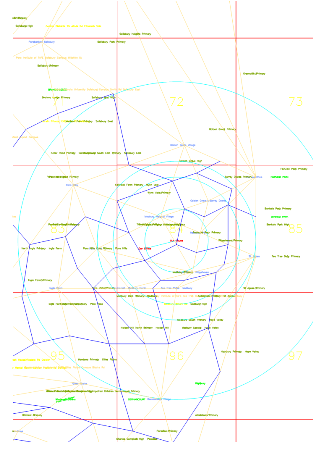 The primary requirement is being able to locate a collection of points in space. Just about anything else is first and foremost concerned with tables and databases. The tabulated data can be collected in MS Access, and otherwise manipulated with MS Excel, and VBA automation can be used for bulk data processing. If have the coordinates for a collection of points then either Access, Excel or VBA can be used to calculate distances between those points. 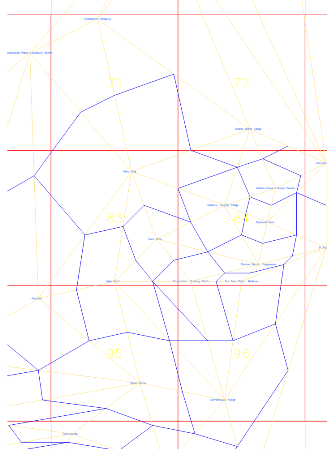 If have coordinates then AutoCAD LT can be used to visualise the data, and add any other graphical elements defined relative to the points: in my case that is typically drawing radial lines, circles, hexagons, associated with catchment areas and travel distances. The problem for experimentation was getting the point coordinates without the expense of digital maps. Today there are various online mapping services, but when I was first attempting to setup a GIS I didn’t have internet access, and certainly could not afford MapInfo and or any data for such package. The closest I got to digital mapping was buying UBD street directory on disk: which was basically a read only application. 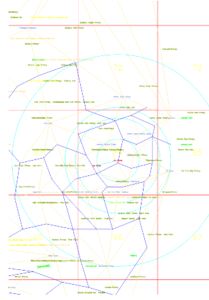 However I discovered that the grid used in UBD street directories also referenced Australian Map Grid (AMG) coordinates. Therefore if I located two points using AMG coordinates on two different street directory maps, I could plot them in Acad/LT at appropriate relative locations. So the first task was to convert the UBD street directory references into AMG coordinates. 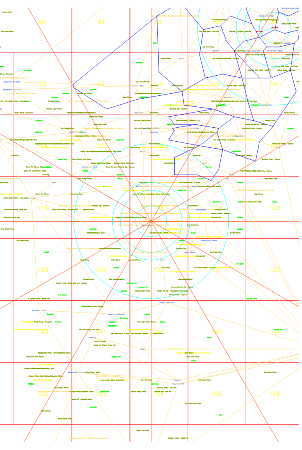 The way to do that was to draw up the map grid for a single UBD street map, the grid being 250 m x 250 m. Whilst the best I can do to locate a point is to place it at the centre of a 250 x 250 m square, such is good enough for experimentation and seeing if there are any geographical relationships which may benefit from a full blown GIS system. 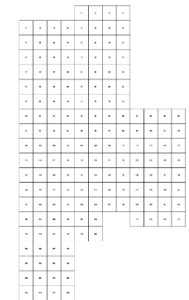 The starting point was to create a block with attributes for a single map grid. 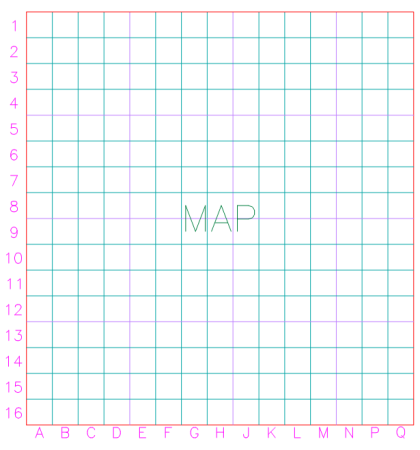 Once have a map block, insert these blocks side by side to create the key plan reference given in the front of the Adelaide metro street directory. Once all the maps located fill in the map reference number attribute. Get the AMG reference for one of the maps, and then make sure that the whole collection is then inserted with that reference as the origin. Once that is done the origin of each map block should now be at its correct AMG location. Use a template file to extract the attributes for the blocks to a simple text file, then import into Excel. Now have the data for a lookup table, which can reference a map to an AMG coordinate. 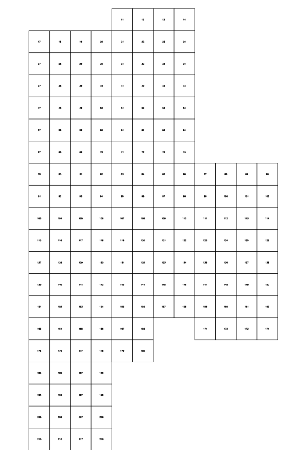 Create another table to reference the UBD map grid references to offsets. Now given a UBD map number, and grid coordinates for that map, these can be converted into AMG coordinates and plotted in Acad/LT. 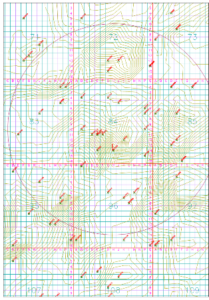 Similarly anything drawn in Acad/LT can be related to the key map overlay , and transferred to the printed street directory. UBD street directories contain lists of various facilities and their grid references, I also discovered that UBD on disk contained plain text (csv) files of some of these facilities (eg. shops, schools, universities, hospitals and churches). So a quick test of the usefulness was to plot this data into Acad/LT using blocks with attributes as place markers. 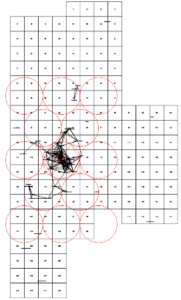 Using such data can then draw radial lines connecting adjacent facilities, and then polygons surrounding a facility based on the midpoints of the radial lines: providing a rough indicator of the catchments for the various facilities. Figures 1 to 3, highlight one problem of manually drawing radial lines and polygons and that is getting lost when zoomed into the area under question. 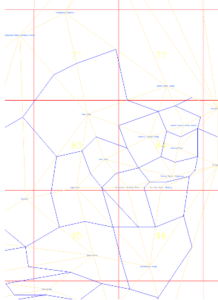 One polygon gets a distorted shape and then all associated adjacent polygons also get distorted: which then requires time to fix. However even with the distorted polygons, it shows there is no uniformity in the location of shopping centres, and the size of their catchments. Figure 4, shows locations of hospitals around the Adelaide Metro area, it indicates that all the hospitals are concentrated near the city centre and thus otherwise poorly serve the metro area. Thus, the building dubbed the world’s most expensive building will not resolve any problems associated with the distance between medical services and the people. If services are not appropriately distributed in the metro area, it’s not surprising how poorly served the rural regions are. To produce Figure 5, data from our project database was mapped to suburb locations, the data was the soil heave (ys) values used for site classification (AS2870 ?). To get the contours, MapMaker Pro trial edition was used. 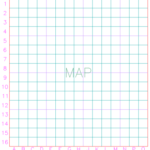 The exercise demonstrated that even with a little data, and crude locational data a reasonable contour map can be produced. Given the amount of data each council area collects about each household property, the councils should be able to locate the Ys values at the centres of each property, and generate a reasonably accurate contour map. With areas of established housing , the need for site bore logs should be considerably reduced: whether for extensions or houses being demolished and replaced. 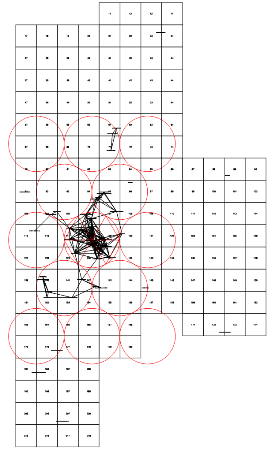 For certain, two adjacent sites may have significantly different site classifications, however the contours of historical data will assist locate where those differences are likely to exist.